Home > How Important is Nutrition in Early Childhood Education? A child’s early years are of vital importance to their developmental growth and wellbeing, both physically and mentally. Giving a child the right care in their early years has the power to positively shape all aspects of their future, and a big part of this care is nutrition. We all know that a healthy, balanced diet is essential for the health and wellbeing of people of all ages, but it is particularly essential for children. However, while good nutrition is essential for a healthy body, its other benefits include increasing cognitive function and aiding academic performance. This article will look at the importance of nutrition in early childhood education, and the food types that all children should be exposed to in order to get the best start in life. There’s a well-known saying, “you are what you eat,” and while this is most often used in the context of adults dieting in order to shed a few pounds, it is not exclusive to that. The logic behind the statement is far more universal and far more meaningful. From the moment a child is born, there are certain foods that they should be fed to keep them strong and healthy. These foods may advance as they grow older, but the simple mentality still remains - some foods will aid your health and happiness, while others will hinder it. Another key thing that good food gives children is energy. A hearty, healthy breakfast for children can be sugar-free cereal with milk, oats with fruit, whole grain toast with a non-sugary spread (i.e. peanut butter), or even pancakes - so long as they are healthy and topped with nutritional ingredients. Nutrition plays a huge part in brain development, especially in children. There are some foods that are considered to be “brain boosting” and can increase brain function such as concentration and memory, which in turn can aid developmental growth. As a rule, a child should have a serving of fruit, a serving of vegetables, a source of protein, a source of dairy and a grain in every meal, no matter their age. Good nutrition can drastically improve academic performance. When a child eats “brain boosting” foods, their mind becomes sharper, and so they become quicker and more alert. It has been found that a child with an iron deficiency (i.e. not getting enough meat, fish or dark green vegetables in their diet) can have less advanced cognitive functions than their peers who are not iron deficient. Worryingly, this can negatively affect school progression and achievements, meaning a young child may not have tools or confidence to move up in school. What’s more, when children are fed healthy, hearty meals, they are more satisfied, are fuller for longer and their mood is more like to remain stable. This is incredibly beneficial in the classroom, as a child who is suitable fed has a higher chance of maintaining concentration, retaining information and getting the most out of their school days. This is why eating a big breakfast is essential for children, as it means by the time they arrive at school they are full of energy, are alert, and are eager to immerse themselves in the day ahead. On the other hand, if a child were to eat sugary or highly processed foods that have less sustenance, they will likely become distracted or irritated. This can have a serious knock-on effect in the classroom and may leave them at a disadvantage academically. It may also leave them at a disadvantage socially, as their mood will suffer and they may act out. 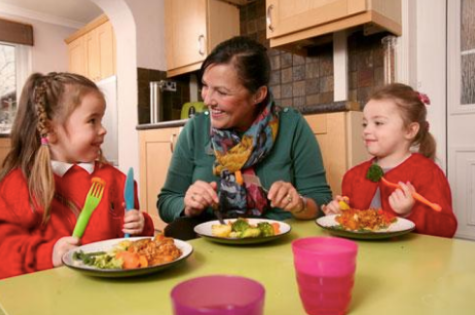 For parents who are, perhaps for the first time, leaving their child in the care of an early years school should be safe in the knowledge that their children are being fed good food. If a child understands the importance of eating healthily and the positive effect it can have on them, the better their relationship with food will be, and the more likely they will remain to eat sensibly throughout their adult life. Likewise, understanding where food comes from and having a hand at preparing food in the kitchen may help to prevent any bad eating habits or fussiness around foods. Teaching children about foods can be done in a fun and interactive way, and this will help the message to sink in. When looking to enrol your child in early years education, you should look for a school that has a quality child care nutrition program. This will mean that your child is exposed to the correct foods and that their body is being nourished from the inside out. Nutrition is a key ingredient in the overall well being of your child. If your young child is eating nourishing foods that are high in vitamins and minerals, they will have more energy, a stronger body and increased cognitive functions, and with this, your child will have a bright and fulfilling future.